Stunning and highly desirable French bebe incised “ P 5 D “, 26 “ ( 66 cm ), perhaps the largest known size of this rare doll, made by Petit and Dumontier, with magnificent bulbous blue paperweight eyes, closed mouth with pouty expression, chubby cheeks and outlined and shaded lips, , well painted brows and thick multi-stroke blondish brows, pierced earlobes, on the original fully jointed wood and composition body, unique only to this doll, having pewter hands and separate wooden ball joints at the shoulders and hips, also with a higher than average proportion of wood to composition less typical to commonly found French jointed bodies. Body patina is original and in good condition with some minor paint loss on one metal hand. ( Normally on this doll the metal hands have lost most to all of the paint and/or have been totally repainted ). She wears all antique clothing consisting of a brown wool dress with wine colored feather- stitch trim and pleated wine silk panels on top of dress above the high waist and puffed up on the shoulders. Undergarments are antique as are the stockings and shoes. The antique blond mohair wig is possibly original or at least of the period as is the spectacular wine colored corduroy wide brim bonnet with well -coordinated feathers and gauze trim. Truly a marvelous example and not to be overlooked!……………………………………SOLD. Pretty 27″ ( 69 cm ) closed mouth bebe with red stamp on back of the head ” DEPOSE TETE JUMEAU Bte. S.G.D.G. 12 “, lovely large clear brown paperweight eyes, evenly arched multi stroke eyebrows with nice lashes, smooth peaches and cream complexion, well modeled and painted lips, pierced ear lobes with blue and white bead earrings. The head is attached by a coil spring to the original fully jointed French wood and composition body ( no markings found ) with mostly original finish with only minor spots of paint retouch ( leg stringing slightly loose ). She is elaborately costumed in a two piece heavy midnight blue velvet and black bead trim design, and antique blond mohair wig over cork pate, a spectacular bonnet made of plum velvet and floral embroidered wide ribbons, and nice antique brown leather shoes with cloth rosettes and stamped on the leather soles ” 12 C.C. (within an oval)”. The blue velvet material of the dress is so far it must be viewed in bright light as not to appear black. A classic Bebe in an imposing size. US$ 3,250. Pretty 16″ ( 41 cm ) French closed mouth bebe with head stamped in back in red “DEPOSE TETE JUMEAU 6”, attached by a coil spring to the original fully jointed wood and composition body stamped in blue ” JUMEAU MEDAILLE D’OR PARIS “. Although finish appears to be mostly original it has the flat finish ( “scrubbed” ) whereas the glossy varnish is either worn away or has been taken off over her many years. She has a nice antique blond mohair wig with side part covering the cork pate, a lovely antique white ribbed cotton and blue braid trim two piece mariner costume, antique socks and antique olive canvas shoes impressed on the soles ” PARIS DEPOSE 6 “ ( with the ” bee ” logo ), old undergarments and a blue cotton cap coordinated to the dress. The blown glass brown eyes are stunning, facial coloring even as are the eyebrows, lashes, and mouth. Dangling from her pierced ear lobes are one bead magenta earrings. A classic model, good quality overall in a desirable size. US$ 2,850.00. 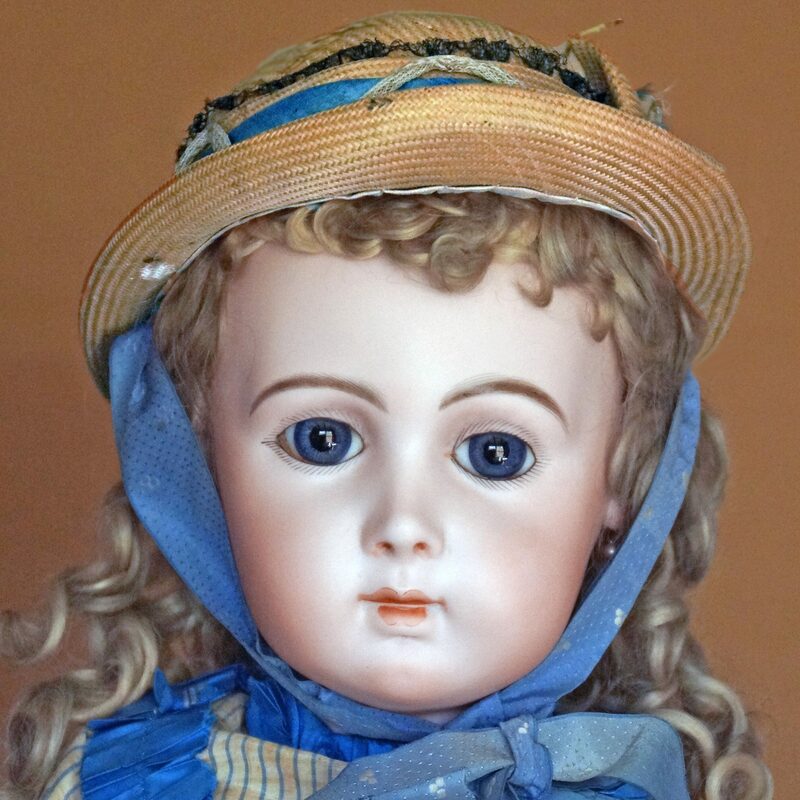 Rare and dramatic 26″ ( 66 cm ) French bebe incised ” F. R. 12 ” made by Falck and Roussel, one of the least well-known but also one of the most coveted dolls of this period due to both her rarity AND beauty. She has large bulbous blue paperweight eyes, closed slightly smiling mouth with protruding upper lip, tiny lashes and thick multistroke brows, pierced ear lobes, deep dimple in chin, and excellent facial modeling and painting. She is on a fully articulated French wood and composition with mostly original finish, and is beautifully costumed in a one piece midnight blue velvet, cream silk, and lace trimmed dress, as well as blue velvet embroidered and dangling bead decoration , antique brown leather shoes with silk ribbon rosettes, and a well-coordinated silk, velvet, and feather boa bonnet. The wig is dark brown human hair over an old cork pate. Although not technically inexpensive she is offered at a much reduced price over what one would normally have to pay due to a well executed professional restoration of two hairlines on the back of the head. It is not readily visible upon routine inspection but only after a strong light is placed inside the head and with no restoration to anywhere on the facial features. With all that to be considered she is being offered at ………….. US$ 14,500.